Portland Bolt was chosen to supply hex bolts and shear plates for the 150,000-square-foot Gulf of Mexico Preservation and Maintenance Facility. 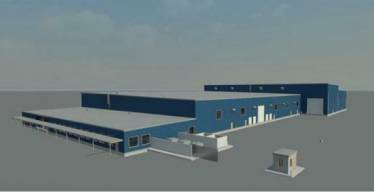 The pre-engineered metal warehouse facility sits on a 30-acre site and offers 20,000 square feet of office space and 11 acres of outside storage and building apron areas. Features include 12.5 acres of heavy-duty concrete paving, ample surface level parking and a design that allows for future expansion up to 300,000 square feet. Portland Bolt supplied 17,000 pounds of galvanized headed bolts and shear plates. Time was critical on this aggressive construction schedule and Portland Bolt shipped all releases on time.